More than 20 million people call Cairo their home and, as soon as you set foot in the sprawling metropolis, it's evident they make it crowded and chaotic, but also exuberant and charming. 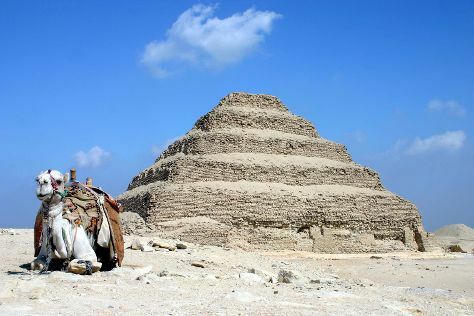 You won't lack for places to visit in Cairo, partly due to the sheer vastness of Africa's largest city, and partly because it harbors a rich heritage and a plethora of historic relics. Millennia of different rulers, cultures, and religions left their mark on Egypt's capital, leaving it with a bountiful tapestry of mosques, lavish palaces, sacred tombs, and ancient artifacts. If delving into Cairo's tumultuous past leaves you feeling overwhelmed, retire to a quiet coffeehouse or a charming hole-in-the-wall restaurant to gather your impressions and take in the buzzing ambience. Cairo is in Cairo Governorate. Take a peek at our international travel planner: Cairo and its charms laid bare and easily scheduled.